The days of the It Bag may be over, but I am always thinking about my next bag. For fall and winter, I definitely prefer a black bag--better to hide the seasons' grime, and black looks best with my leopard coat--and while I already have two or three serviceable black bags, I kind of want a new one. The thing I love about my current purse, the Botkier James hobo, is that it has both a shoulder strap and a longer, crossbody strap, a best-of-both-worlds situation which allows me to have my purse and wear it too, if you will. I would, however, like something a tiny bit bigger and, ideally, something that inspires me to break my compulsive purse habit. 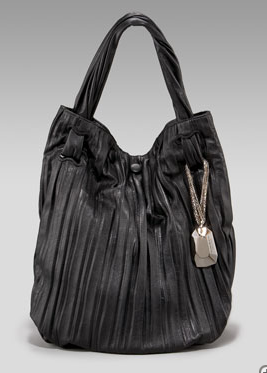 Enter Donna Karan's Eldridge Tote. Much like her ingenious cozy wrap sweaters, the bag can be worn multiple ways: Lengthen the strap for a crossbody style; button the sides and shorten the strap for a hobo; unbutton the sides for an expanded tote; or tuck up and button the ends for a much more compact version. Even the silver charm that comes with the bag can be worn shorter and wrapped or long and dangling. In other words, you can wear this bag so many ways that if you get tired of it, the only step left for you is purse rehab. 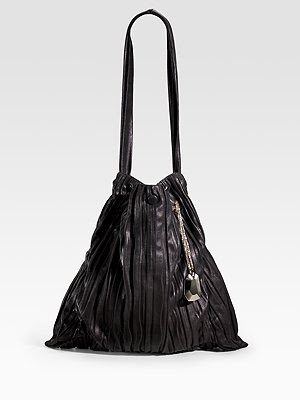 For those of us still suffering through It Bag flashbacks, the Eldridge has an understated--yet, with its Fortuny-inspired pleats, still luxurious--look that's perfect for these don't-flaunt-it-if-you've-got-it times. It's so stunning, perhaps Lindsay Lohan thought it would distract us from the fact that she's not wearing pants in the above photo. Of course, this bag does take a lot of "it" (cash, that is), with a price tag of $1,495, however, that's significantly lower than many comparable bags, which can run well over $2,000. And when you look at it as four bags in one, that's like less than $400 a bag, which certainly less than I've spent on my last few bags. Nothing like a little math to justify a splurge, but with so many ways to wear it, the Eldridge is worth the investment.